I am looking forward to this weekend. My 2-year old daughter Maeve and I will be attending the opening festivities for the Metro Gold Line tomorrow, and we’ll be heading up to the northern San Fernando Valley for CicLAvia on Sunday. 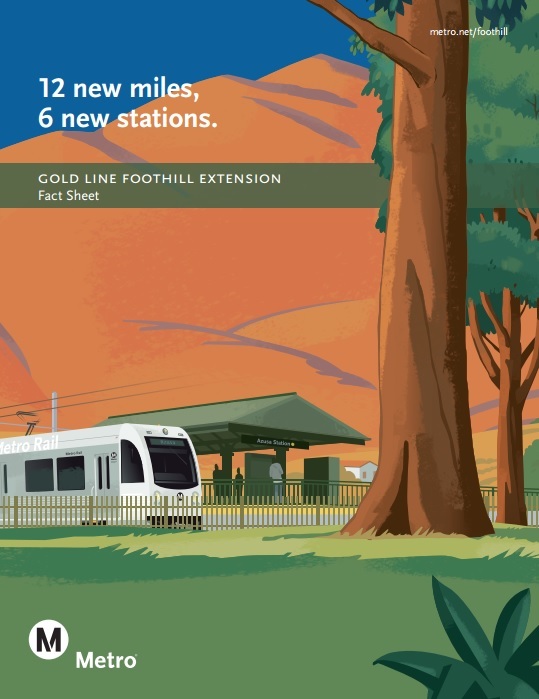 The Foothill Gold Line opens tomorrow! If I were transportation investment king, I would not have prioritized building the Gold Line; it is not quite a corridor with high ridership projected. There is too much in the way of free parking. Some of the public art investment is directed more toward freeway drivers than rail riders. The time for this criticism is in the past, though. As I attended the Azusa station celebration, and I got to ride a press preview train, I kind of got the bug. Now, I confess I am excited about this shiny new rail infrastructure. I am glad that the Gold Line will mean that I can much more easily visit my niece and nephew who attend college in Azusa. I am glad more of L.A. County will be within easier reach of my typical bike-transit trip. And I am really glad to see that Foothill Gold Line communities are embracing these stations as opportunities for transit-oriented development and downtown revitalization. This Sunday’s CicLAvia breaks new ground in bringing open streets to San Fernando Valley communities of Pacoima, Arleta, and Panorama City. If I were CicLAvia king, this wouldn’t be where I would have picked for an open streets event. 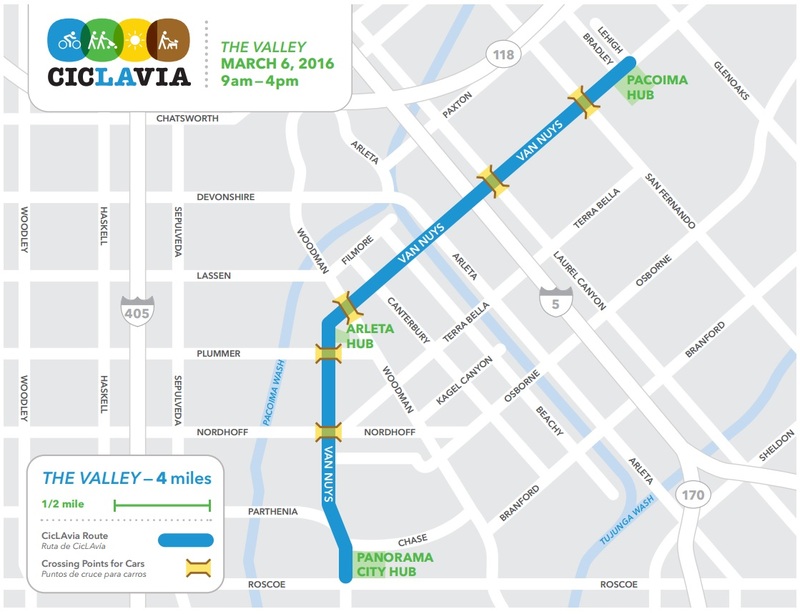 It will the first CicLAvia route that is not located along a Metro rail route. I think that this might mean more people will drive to get there. This will be the first, but not the last. Thanks to Metro funding, there are lots and lots of L.A. County open streets events are coming up this year. Not all of them will not be rail-connected; examples include Downey (May 1) to Lawndale (April 25). I used to think that CicLAvia would have a difficult time working in the San Fernando Valley. I remember, when I was one of the organizers of L.A.’s first CicLAvia, we were told by a senior law enforcement officer that this kind of event just wouldn’t work in downtown Los Angeles. “This isn’t San Francisco” were his words. Later, many early CicLAvia doubters, including my local senior lead officer, expressed their wholehearted support for CicLAvia after seeing how successful the event was. Hopefully CicLAvia will change my mind, the way it has changed so many people’s minds. I am looking forward to being proven wrong – to seeing how successful the Valley’s second CicLAvia will be. All this to say that, despite lots of loud critics in NIMBY factions and the mainstream media, projects like the Foothill Gold Line and CicLAvia – The Valley show me that livability works not just in L.A.’s population-dense pedestrian- and transit-centric core (where I live) but in our farther-flung more car-centric suburban communities, too. These communities want more transportation choices, more health, more walkability, more livability – the same way mine does. Southern California is really undergoing a transformation under our noses, even if I feel like I am slogging through the rearguard trenches many days. It is weekends like this one that give me hope for my city. And for the city my daughter will move through. CicLAvia became my FAVORITE thing about living in Los Angeles from the very first event. I couldn’t believe how happy people were (including me in all of my normal complain-filled glory), how few problems there were and how many people in LA would bike if given a safe place to do it. Last year CicLAvia appeared outside the front door of both my work and my home, which is sometimes that was a major transformation in itself despite the fact I haven’t even owned a car in nearly a decade. For one day, I finally got a glimpse of what MY neighborhood(s) and my daily life could be by prioritizing pretty much any mode of transportation besides the car and it was FANTASTIC and AMAZING and the world didn’t end. Of course, the flip side for me is a stark feeling of depression and sadness when I bike some of those same streets today and feel so alone as a cyclist, so detached from everyone else (pedestrians and cyclists generally seem more willing to talk with and engage with random people than those in cars.. weird how that works) as cars zoom past me within inches at 40+ mph or run red lights going straight long after the pedestrian signal has changed. To me though, the point of people ACTUALLY WILL BIKE and WALK if you give them a place where they can do those things safely is SO IMPORTANT. Los Angeles isn’t some extreme mutant city in that respect. People have bikes. People want to exercise. People want to enjoy explore and living in Los Angeles. Sometimes making change can be a bit of a chicken and egg problem.. people don’t want to support proper bike and pedestrian infrastructure because “no one” uses it, but “no one” uses it because what’s there isn’t really what they need and is a half-assed solution. CicLAvia puts the proof in front of our eyes. You can’t say no one bikes or walks in LA when there’s literaly thousands of people doing that. I wish I could see more improvement in the city and I know things are changing, but some of us are impatient and see what this city can be and want us to get to that as soon as possible. I live in Monrovia and have been eagerly waiting for this moment FOR YEARS. I will definitely be on that train all day tomorrow. As for CicLAvia, though there are opportunities to quibble over specifics, overall it continues to be one of the best things to happen in LA in recent years. Love it.